Trucks and especially big, heavy duty trucks are driving the automotive industry right now. Chevrolet just introduced its new 2020 Silverado HD at the Flint plant where the trucks are built. Chevrolet also announced that it will add 1000 jobs at the Flint plant to build the new heavy-duty hauler. The majority of those jobs will go to other General Motors employees facing layoffs from plant closures. Chevrolet is calling the 2020 Silverado HD its strongest and most capable Silverado ever. The new beast will be capable of towing an amazing 35,500 pounds. The all-new Silverado HD will be available in five different trim levels — Work Truck, Custom, LT, LTZ and High Country. In all, the new 2020 Silverado will be available in 22 cab, bed, chassis and driveline configurations. The new Silverado HD will feature two new powertrains. The standard engine is a new 6.6L V-8 gas with direct injection making 401 hp and 464 lb-ft of torque. That’s an 11 percent increase in horsepower and a 22 percent increase in peak torque, respectively, resulting in 18 percent more towing capability. The second powertrain option is a Duramax 6.6L Turbo-Diesel V-8 engine making 445 hp and 910 lb-ft of torque. The Duramax is coupled with an all-new Allison® 10-speed automatic transmission. Chevy claims that every component between the transmission and the wheels has been upgraded to enable an available 52-percent increase in max towing capability — now up to 35,500 pounds on Regular Cab, two-wheel drive, DRW, diesel models. At this point, Chevrolet is not releasing fuel economy numbers. Chevrolet is concentrating on improving the towing experience for customers. It is responding to research showing that 90 percent of all heavy-duty truck owners use their trucks for towing. Chevrolet offers not just more towing capacity with the new models but technology making the entire experience easier. Chevy has designed a new set of trailering technologies, including a new transparent trailer feature, designed to help improve visibility, easier hitching and more driving confidence when towing a trailer. The 2020 Silverado HD offers up to 15 camera views, including HD Surround Vision, Bed View, an industry-first transparent trailer view, and an accessory camera. The transparent trailer view helps with visibility through the trailer as if the trailer was not there providing added confidence when towing. The transparent trailer helps with navigating parking lots, merging into traffic or when making tight turns. It uses two cameras — one tailgate-mounted camera and an available accessory camera (installation required) mounted on the rear of the trailer — to provide a wide display that helps the driver to virtually see through and alongside the trailer. Chevrolet also has a special in-vehicle Trailering App complete with trailer light test, trailer electrical diagnostics, trailer tire pressure and temperature monitoring, maintenance reminders and pre-departure checklist. Many of the in-vehicle Trailering App’s functions, including trailer profile creation and trailer light test, are also available with the myChevrolet mobile app, a feature that offers convenience when the owner is outside of the truck or trailer. Even the 2020 Silverado HD’s mirrors are designed differently for enhanced trailering. The new larger and more functional door-mounted trailering mirrors are standard on all 2500HD and 3500HD models. The surface area of the mirrors is larger, for a greater field of view compared to the current model, and an available power extension feature makes it easier to adjust the view from the driving position. New for 2020 is the forward-facing spot lamp on each mirror that shines light at about a 45-degree angle, providing illumination on the job site or camp site. There also are side-view cameras mounted within the mirror housings, and when equipped, mirror-mounted puddle lamps and two rearward-facing spot lamps are also available. 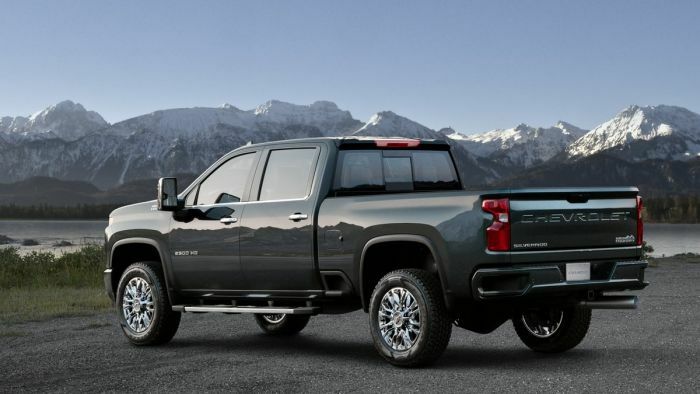 The 2020 Silverado HD is 10 inches longer and nearly 2 inches wider than previous models. From a design standpoint, the 2020 Silverado HD looks less like the light duty version than ever before. The roof is the only shared sheet metal between the two trucks, every other piece is exclusive to the HD version. Inside the truck, the longer length allows for more legroom, greater headroom and more storage. Chevrolet debuted its all-new 2020 Silverado HD just ahead of the Chicago Auto Show, which is known as a consumer-based show. Usually, the Chicago show is focused on trucks, because that is what the crowd is clamoring to see. Also, because the show takes place in the gigantic McCormick Center, all of the auto companies have the ability to display virtually every different model they produce. The announcement that GM will be adding 1000 jobs to the Flint Assembly Plant comes at an important time. Approximately 6000 union workers are facing layoff at plants in the U.S. and Canada. Previously, GM announced that about 2700 open jobs could be filled by some of those workers. Flint Assembly builds both the Chevrolet Silverado HD and the GMC Sierra HD.